I share this to encourage and exhort you. I want to encourage you if you feel alone in your hurting marriage. And I want to exhort you to not become complacent in your marriage. In the everyday, in the little things, in the big things, in the dry spells, and the wonderful spells, love each other deeply. It will be hard. It will challenge you. Sometimes it won’t be fair. But it can change everything. I wrote the following piece nearly 6 years ago. Aaron and I were coming out of the most devastating time in our lives. In the course of a year we had lost a baby and nearly lost our marriage. By the grace of God, with gut wrenching hard work, and more tears than I ever care to cry again, we came out on the other side. Miraculously, I got pregnant again with our 5th baby, and that pregnancy served as a daily reminder that real love, God’s love, is stronger than anything else in this world. And while I would never have asked to walk through those trials, I can say now that they taught me the most important lessons I have ever learned. In the darkest and loneliest of times, I found the love of a Heavenly Father who didn’t abandon me, and in fact, loved me in a way more deep and true than I have ever known. I found that real love is still there in the hard places. That is where it matures, and becomes more beautiful. That is where it is refined. That is where it becomes real. 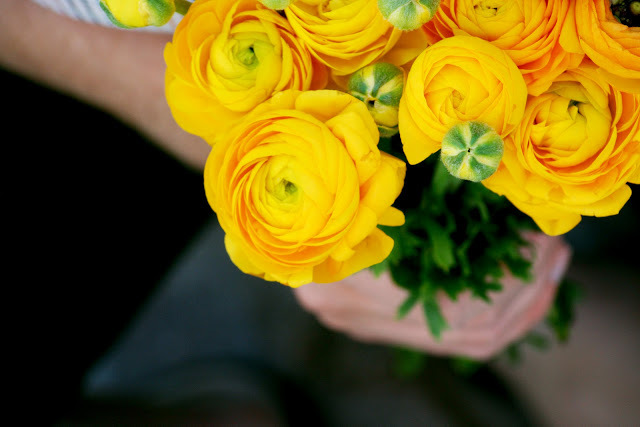 Yellow ranunculus always make me think about when I fell in love. They were the first flowers Aaron ever brought me. He was romantic from the very beginning. He planned us picnics, surprised me with things like a train trip to visit the San Juan Mission and wrote me lots and lots of love letters. He knew how to woo me. We’ve been together now for almost 17 years. He still brings me flowers and writes me love letters. And after taking a sabbatical from date planning, he’s back at it, and better than ever. But truthfully, the way romance looks in our relationship has changed. And I think it’s better now. Having a baby changes things. It forces you to reveal your true self to your husband in a way you may never have before. You cry a lot and eat ice cream in bed. You aren’t the girl he fell in love with, always wanting to hold hands and snuggle on the couch. The 2 of you can’t even fit on the couch together anymore. And then the baby comes and life changes even more. Your man isn’t first in your life anymore; someone else has replaced him utterly. And if he’s lucky, he might get some of the leftovers of you at the end of the day, but you will probably smell like spit up, and have greasy hair, and won’t want to be touched because you’ve had baby sucking on you all day long. There was a moment I’ll never forget, when our first was a newborn, with his first ear infection. I was a weeping, tired, and distraught new mommy. Aaron did something far more romantic for me than bring home flowers. He met me where I was and loved me. As I sat on the couch, nursing James in the middle of the night for what seemed like the thousandth time, Aaron came in to the living room and asked if he could help. Of course he couldn’t help! Could he nurse the baby? I had to do everything. And we were all going to suffer while it happened. I said some of those things to him, and thought others. Aaron didn’t say, “fine!” and go back to bed. Instead he sat down at my feet, picked them up and began to rub them. The tears came instantly, and I sat on the couch, weeping, because I knew I wasn’t alone. And he loved me when I least deserved it. After William, our second, was born, I was in the hospital recovering from a c-section. Aaron stayed with me the whole time and got to be a part of it all. Even the parts that I never thought I’d let him be a part of. After a c-section, you have to have a bowel movement before you can go home. So, there I was, having my big moment, and Aaron was practically in the bathroom with me. There was no hiding what was going on. “Way to go babe!” he cheered for me from the adjoining room. Later on, I had to ask him to come in the bathroom and change my pad because I couldn’t bend over. But the more I thought about it, the more I realized I didn’t need to be. Real life and real love are not always pretty. Real love is caring for one another even when it’s gross, ugly, or you really don’t want to. Real love is not self seeking. Real love is holding your wife in the shower while the tears course down her cheeks and the blood courses down her legs, and you are losing your baby. It is loving your husband even when you hate him. Real love is hanging on, saying “I’m sorry”, saying “I forgive you”, and meaning it. I think about couples who have been married for 40 or 50 years. I think of the good and bad they have experienced together. I think of the ugly times and the beautiful times. I see them together at the store sometimes, walking slowly, helping each other get the shopping done. I saw them in my grandparents. My grandma cared for my grandpa so lovingly when he could hardly hear anymore, or get out much. She helped him to the bathroom and made him the meals he loved to eat. She did it every day because she loved him. I am just beginning to really learn what that kind of love is. And it is my greatest hope that someday Aaron and I will be walking slowly through the grocery store together, still holding hands, and still in love. Wishing you a love like that too.